In case of booking for two passengers we supply a photographer without additional fee who will take photos on the greatest moments of the tour  take-off, flying and landing experiences. You can take home the pictures developed, on CD or we can e-mail them to you. Departure: Tököl (LHTL). Recommended route: Tököl-Visegrád-Esztergom-Tököl, approximately 60 minutes. This is one of our most popular route as during the tour we also fly over Buda. The summer season in Lake Balaton has already begun. We have taken beautiful pictures. You can look at some of them in our Picture Gallery. Further, faster and with greater safety. DA40 is one of the best equipped single-engine plane nowadays. On board Garmin 1000 glass cockpit is installed combined with autopilot. Its leather seats offer an enjoyable journey and you can also enjoy the excellent view of landscape through its big windows. In the cabin air diffuser is ensured for each passenger to make the journey more comfortable (pictures above). This plane is a well known American type of aeroplane. It is four seated, has a full metal skeleton, a single-engine tricycle running gear and is built with a low-wing. Its biggest rival is Cessna 172 and Beechcraft Musketeer. All the Cherokee has one door which is on the co-pilot side. It is a popular training plane. Departure: Gyúró (LHGR) or Tököl (LHTL). It has a traditional and popular technology. 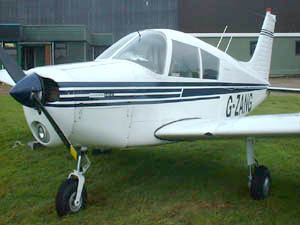 Most of the schools use this type of plane (picture beside).